New for 2017 is our double fat Strat® HH black 1 ply 0.120" acrylic pickguard with our signature feature of the rounded and polished edge. Your everyday typical Strat® pickguard will have a 45° beveled edge that is found on just about any Strat® for the last 50+ years. 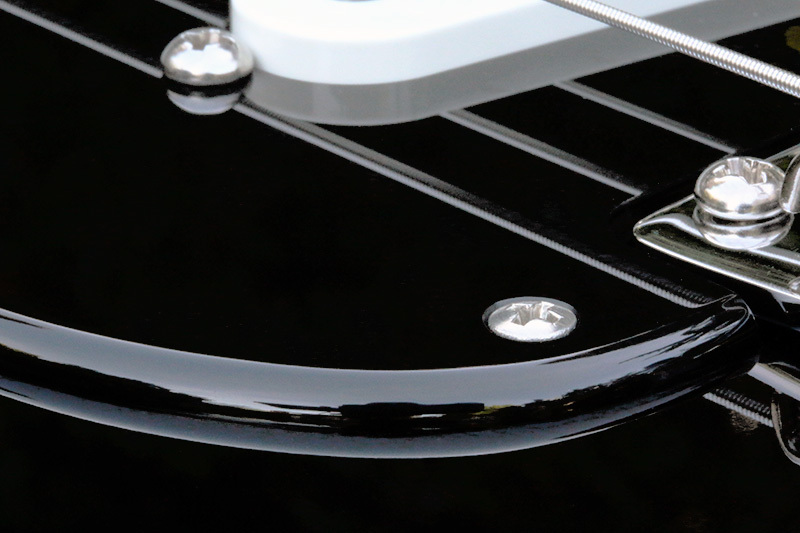 The rounding and polishing of the perimeter edge of a pickguard gives it a presence and style that really sets it apart from the rest, see photograph below. These pickguards are the same style found on Gilmour's Black Strat® except these do not have the small slot for the recessed mini-toggle switch and these are for two Humbuckers. This pickguards bridge pickup cut-out dimensions are designed around Seymour Duncan's Trembucker design (without a metal cover) which is proper for a tremolo bridge equipped Strat. This pickguards neck pickup cut-out dimensions are designed around a standard size Humbucker (without a metal cover). Both pickups utilize a standard 2 screw mounting system with a mounting spacing of 3.10". Be sure to confirm your pickups mounting requirements for compatibility with this pickguards specifications before ordering. This pickguard has a standard 11 hole mounting pattern, the selector switch mounting holes are not countersunk and require Phillips round head mounting screws. Potentiometer mounting holes are standard 3/8" in diameter. Each pickguard is copper foil shielded in the control region only. Neck Pickup Cut-Out: 2.75" x 1.48"
Bridge Pickup Cut-Out: 2.853" x 1.48"
Both Pickups Mounting Spacing: 3.10"
Each pickguard is custom manufactured on an "As Ordered" basis. There is up to 21 day build time on these pickguards. No returns or exchanges so be sure of your pickups compatibility and mounting requirements before ordering. Representative illustration of the rounded and polished perimeter edge. 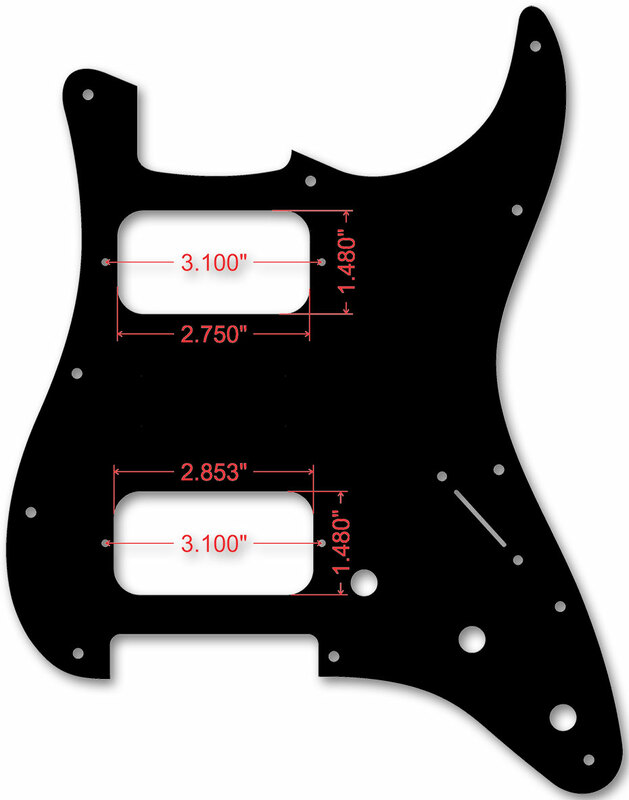 IMPORTANT NOTE: Our Acrylic pickguards are 0.120" thick (+/- a few thousands of an inch) so keep this pickguard thickness in mind when installing a 0.120" thick Acrylic pickguard on a Strat® with a 22 fret neck, make sure you measure the total amount of clearance you have underneath your 22'nd fret overhang and the surface of your body to ensure that there is enough room to accommodate the 0.120" thick Acrylic pickguard with at least a few thousands of an inch of extra clearance for breathing room between the top surface of the Acrylic pickguard and the underside of the 22'nd fret overhang. The vast majority of 22 fret necks and body combinations will work fine with our 0.120" thick Acrylic pickguards but we have seen a rare few that won't and will need some sort of adjustment for correct fitment. You DO NOT want to tighten down any neck where its 22'nd fret overhang makes contact with the surface of the pickguard, you could very well lift the fingerboard away from the neck by the leveraging forces of tightening down the neck.